THE OIREACHTAS HEALTH Committee has heard that more people die each year in Ireland from drug overdose than from road deaths. Dr Gerard Bury told the Health Committee the issue of overdose was down people not being able to access proper medication and supports to combat the issue. 203 people died in 2013 from a drug death in which an opiate was implicated. Dr Bury was speaking to the committee in relation to the introduction of medically supervised injecting centres in Dublin. Medically supervised injecting centres are places where intravenous drug users could go to inject in a setting with a health professional. There are currently over 90 such centres around the world. The Misuse of Drugs (Supervised Injecting Facilities) Bill would allow centres to be introduced in Ireland if it is passed. Speaking today, Bury said that there was increasing evidence that the centres were an “effective harm reduction measure” for certain groups of drug users. Speaking at the committee, former Drugs Minister Aodhán Ó Ríordáin said that people were dying on the streets of Dublin regularly from overdose. “People die behind dumpsters, people die in toilets, people die in urine-soaked stairwells,” he said. People are literally dying on the streets of this city. Also speaking at the committee, Tony Duffin, director of the Ana Liffey Drug project which helps drug users in Ireland, said that medically supervised injecting centres would help users on the streets. Duffin said that there are around 400 users injecting openly in Dublin. 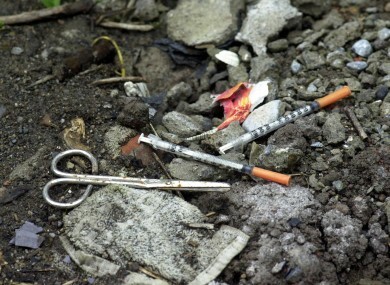 “People who inject drugs in the public domain do not want to do this,” he said, stating that people injected drugs on the streets as they had no place else to go. Duffin said that centres would be an “empathetic and effective response to the issue of public injecting”. He said that the centres would reduce risk, would take the issue off the streets and would help users. “Importantly they will save lives,” he said. No one has ever died from an overdose in the 90+ supervised injecting centres around the world. Sinn Féin TD Jonathan O’Brien – who sits on the committee – said that he widely supported the bill but had a number of issues with certain elements it. These included aspects which required that drug users register their details before they would be permitted to use the centres. O’Brien said that this would dissuade users from using the centres in the first place. He said that the Government needed to be “looking at as few obstacles as possible” for people to come to the centres. He also took issue with the section of the bill which would allow gardaí to enter the facilities at any time without a warrant. “I still believe there is an element within Garda Síochána… who are not convinced of this project,” he said. Both Fianna Fáil’s Jack Chambers and Senator Lynn Ruane said they supported the introduction of the centres. The Committee also heard about concerns to do with the availability of the drug Naloxone, which is used to prevent death from overdose. The Committee will hear from members of the gardaí in a second session this evening. Email “'People die in toilets, people die in urine-soaked stairwells'”. Feedback on “'People die in toilets, people die in urine-soaked stairwells'”.